Greetings and thank you for taking the time to review the Madison Township web page. 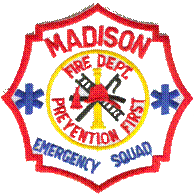 I’m Ron Luttrell, Fire Chief of Madison Township Fire Department. It is my privilege and honor to lead the very fine group of highly trained, competent individuals that make up our team at the Fire Department. Our mission is to reduce the loss of life, and property by providing effective and efficient fire suppression, advanced emergency medical services, fire prevention and public education services to our community. We will achieve our goals by employing a high degree of professionalism, training, operational readiness, public education and offering compassionate care to individuals in their time of need. While I am newer to the community, I am no stranger to providing strong leadership and managing within public safety services. I have more than 30 years of experience in the fire and EMS field. Throughout my career, I have provided emergency services for a volunteer fire department for a small village, a small municipal fire department and a township combination fire department, all in northwest Ohio. In May 2017, I was appointed as Fire Chief for Madison Township. My goal is to ensure we are offering the most efficient and effective safety services to the community without jeopardizing the safety of our personnel. We would like to extend an open invitation to the public to meet the on-duty personnel during normal business hours at either fire station. Please stop in, introduce yourself and become familiar with the services we offer to the community. Thank you and enjoy the redeveloped web page.